Zucchini season has commenced. I, for one, am thrilled about this development. That, and the beginning of Summer of Riesling. Because how can you not get excited about an entire summer of delicious Riesling? (Though I must admit that this summer, like everyone else, I'm obsessed with Albariño wines). I've never understood why people complain about needing to dispose of large quantities of zucchini. I can never seem to keep enough zucchini in my kitchen. In any case, it's not even peak season yet and everyone is making zucchini noodles and pasta, which is an acceptable treatment. But I'm proposing that you do something a little different here. I'm proposing that you shred or grate your zucchini and then serve it up as a fantastic raw salad. This is about as refreshing and delicious as it gets. For instance, it was so hot last weekend that I couldn't comprehend the thought of solid food. I walked down to Liquiteria for a smoothie lunch (though if it hadn't been so humid, I would have walked the 30+ blocks to The Butcher's Daughter for one of their juices). My liquid lunch turned out to be an ill-advised decision because I crashed by about 4 p.m. But it was still blistering outside. I had this salad in the fridge, though, and it made for a satisfying and cooling mid-afternoon snack. I sat by an open window in my apartment, snacking on the raw zucchini and contemplating the rising stack of literary magazines on my coffee table. (They just keep arriving in the mail and I've been averaging, like, one short story every three days. It's absurd.). I topped this off with purple micro radish, which has been a favorite ever since I discovered it at the market earlier this spring. If you can't find micro radish, substitute any other variety of micro greens or even sliced, spicy radishes. The shredded zucchini is the foundation, but the other ingredients are pretty flexible. The one step you shouldn't neglect is salting the zucchini before you dress it. Zucchini releases more water than you might expect. In fact, as soon as you slice into it, little mercury beads of sweat begin to appear on the cut surface. And when you dress the salad and add salt, it will release even more moisture, diluting the dressing. Definitely salt the zucchini beforehand. Wash and trim the zucchini (no need to peel). Grate the zucchini on a box grater or process in a food processor with the shredding attachment. Toss the zucchini with 1/2 tsp salt in a colander. Set aside to drain for 30 minutes. Whisk together the champagne vinegar, mustard, lemon juice, and olive oil. Wash and halve or quarter the cherry tomatoes. Drain the zucchini and squeeze out all of the extra liquid. You can either wrap up the zucchini in a clean kitchen towel and wring it dry or just use your hands for the task. Toss the zucchini, cherry tomatoes, and vinaigrette together. Adjust the seasoning, adding more lemon juice or vinegar. It should taste bright and refreshing, not dull or chalky. Add more salt, if needed. Chill for at least 20 minutes before serving. Chiffonade the basil: stack the leaves like a deck of cards, roll them up into a cigar (or yoga mat) and slice into 1/4-inch thick ribbons. To serve, portion out 1 cup of the salad on each plate. Scatter micro radish and basil over the salad and drizzle with additional olive oil. Note: Substitute white balsamic, white wine, or red wine vinegar for the champagne vinegar, if necessary. 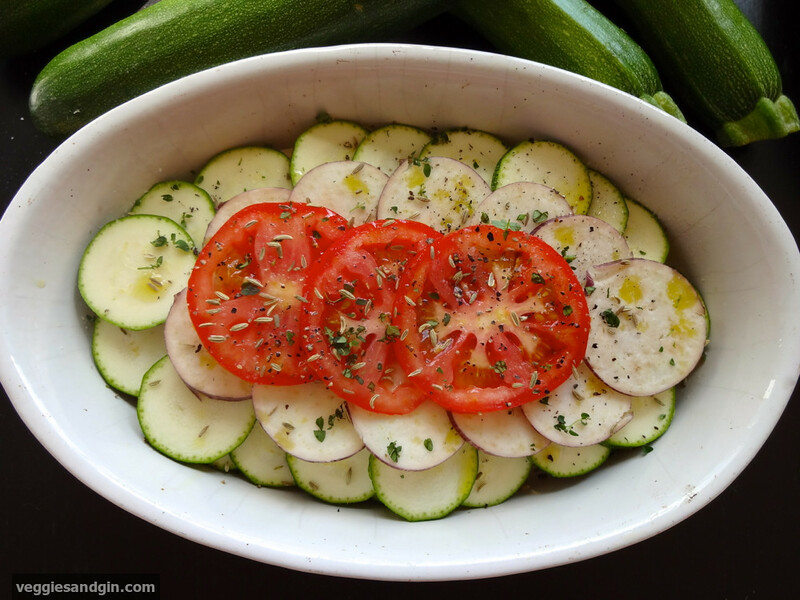 The zucchini should be pretty salty after draining so you may not need to add additional salt to the salad. I took a cooking class on Provençal cooking recently. In addition to coming home with delicious eats (my freezer is still packed) and becoming once again obsessed with all things French (south of France in summer 2014, people), I picked up beautiful ideas on how to use my little kitchen herb garden. On my kitchen windowsill, I currently have lavender, thyme, rosemary, sage, mint, oregano, and basil - the perfect array for southeastern French cuisine. Provençal cooking combines classic French methods with Mediterranean elements such as garlic, basil, olives, lavender, and honey. Herbes de Provence are typically used to flavor dishes. 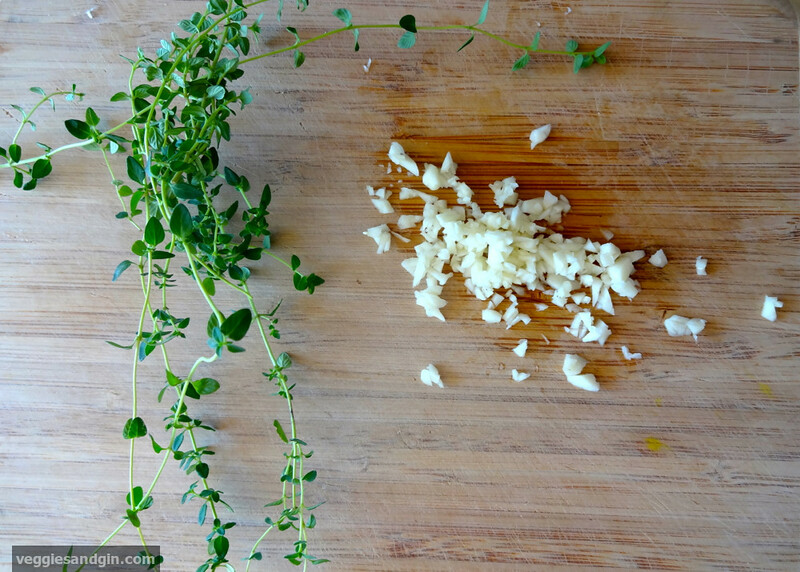 The classic combination consists of thyme, rosemary, bay leaves, savory, and marjoram. Occasionally, variations may include fennel seeds or lavender. I use fennel seeds and fresh thyme here but if you do not have either of those on hand, you can substitute any of the other herbs or even a dried Herbes de Provence mix. I have done that in the past and it works beautifully. This recipe is an adaptation of a recipe we learned in class. It's a classic tian, which is basically just a layered vegetable dish. Our teacher referred to it as a "crustless tart" but, really, we're layering vegetables and herbs (with an optional cheese layer). Unfortunately, it's not a particularly trendy dish at this point. In fact, it feels kind of retro and decidedly kitsch. I would imagine that tians were all the rage at dinner parties in the 1980s in the US. (Can someone fact check that?). But it looks pretty and it's a very cozy thing to have for dinner. There has been some downright autumnal weather in NYC as of late. Turning on the oven to prepare a simple tian feels right. There are infinite variations on the basic formula. Just do a Google search and you will see hundreds of very different recipes. I use a trio of eggplant, zucchini, and tomatoes, which makes sense for the season. It's a great way to use up end-of-summer zucchini and eggplant, especially if you belong to a CSA and are assailed with these items every week. And beautiful fresh tomatoes, which are finally in season, are everywhere. I will totally experiment with heirlooms or thinly sliced onions or very thinly sliced (like with a mandoline) potatoes or sweet potatoes in the future. For the prettiest and neatest appearance, look for slim eggplants and small to medium tomatoes so that all of your vegetable slices look roughly equal. I'm about to impart some kitchen wisdom on that eggplant. This was new to me but according to Deborah Madison's Vegetable Literacy, eggplants are tropical plants and do not like to be cold. In fact, most refrigerators are far too cold for the eggplant. But if you leave it out on the counter, it will start to lose its moisture. The best way to store an eggplant, if you can't use it right away, is to wrap it up well before refrigerating. But you really should use it as soon as you bring it home because age and cold storage produce that bitterness that most people associate with these plants. If your eggplant is not very fresh and you're concerned about bitter elements, you can salt the slices to draw out the bitter juices. See below for instructions. I find that I never need to do that here, for some reason, but I also use my eggplant right away when I bring it home from farmers market. Do what works for you. The other great thing about a tian is that it is very forgiving and the recipe is easily adjusted based on the size of the dish, the number of servings, and the vegetable supply. It can be an entrée or a side. I tend to think that most dishes I make would pair well with fresh seafood but this really would. Of course, you can also serve it with chicken or lamb or something more substantial. I confess to just eating it as is with some soft-boiled eggs or a dollop of ajvar. It's a great light summer dish. If you need to salt the eggplant, toss the slices with a little salt and then let it sit for at least 30 minutes or up to a few hours to draw out any bitter juices. Liquid will bead on the surface, which you can just wipe off with a paper towel. Preheat the oven to 350 degrees F. Rub the bottom of a shallow oval or round baking dish with 1 tablespoon of the oil. Scatter the garlic over the bottom of the dish. Arrange the vegetables slices in concentric circles, starting with the outer circle, alternating each ring with each vegetable to create rings of contrasting colors. Sprinkle each layer with a little bit of the remaining olive oil, thyme, fennel seed, salt, and pepper. When you reach the top of the dish, season the top layer with the oil, herbs, salt, and pepper, and additionally, sprinkle the dish with some lemon juice and 1/4 cup water. Bake uncovered, tilting the dish occasionally to baste the top with the accumulated juices, until everything is tender and lightly browned. Depending on how large your tian is, this should take approximately 45 minutes. I made a smaller version for the photos, which was done in about 30 minutes. If you're using the cheese (I don't really find it necessary), take the tian out near the end of the baking time, sprinkle the top with the Parmesan and then bake until lightly browned, for about 2 to 3 minutes. I prefer to just sprinkle the finished dish with more fresh thyme and fresh parsley. As with most layered dishes, let it cool slightly before slicing and serving. Will keep in the fridge overnight and can be served cold (in my opinion, at least).